NOTE: We recommend you pre-extend in Colombo, with time to acclimatise and explore the city. On arrival we transfer from the airport to our seafront hotel, conveniently located to explore the city at your leisure. Colombo to Anuradhapura: From Colombo we drive (4-5 hours) along the coast, via endless rows of coconut palms, paddy fields and woodlands, before reaching our hotel which is immersed in nature and evokes the atmosphere of the ancient capital of Anuradhapura. After lunch there is time to swim and relax in the landscaped gardens of our hotel. In the late afternoon there is optional walk through the surrounding farmland and woods (2 hours). Anuradhapura: A full morning, and then late afternoon, exploration of ancient Anuradhapura, dating from the 4th century BC, famous for its well-preserved ruins of ancient Sri Lankan civilisation. There is time in between to go for a swim, have a siesta or simply escape the midday sun. Polonnaruwa: We drive (2.5 hours) to Polonnaruwa, the 2nd capital of Sri Lanka after Anuradhapura, where we explore on foot the many vestiges of this ancient civilisation remain – including numerous temples, gardens, statues, dagobas and the renowned ‘reclining Buddha’. After lunch we drive (1hour 15mins) to visit Sigiriya – or ‘Lion’s Rock’ –, which was chosen as the site for a magnificent fortress in the 5th century AD, complete with palace and pleasure gardens, and renowned for its unique frescoes (walking time 2.5 hours). We then continue on to Kandalama (45mins) and our lakeside hotel. Dambulla and Kandalama: After an optional early-morning lakeside bird-watching walk (1.5 hours), we visit the Dambulla Cave Temple, a 1st century complex of caves filled with statues and paintings from different eras dedicated to Lord Buddha (2 hours). A jungle trek in the afternoon (1.5 hours) takes us up to an outrcrop affording spectacular views of the lake, mountains and surrounding countryside. Kandalama - Kandy: We drive (1.5 hours) through lush, green countryside and the island’s main spice-growing area to Sri Lanka’s Central District. Here we begin a 3-hour walk following country lanes through spice plantations and farmland. In the afternoon we drive 1.5 hrs to visit Kandy’s magnificent Royal Botanical Gardens, renowned for its 300 varieties of orchid and myriad bird species, before driving into the city to visit the Temple of the Sacred Tooth Relic, believed to house the upper canine tooth of Buddha himself! Kandy – Nuwara Eliya: We drive (2.5 hours) up into the high hills, where we enjoy a scenic walk through picturesque tea plantations, via workers’ vegetable plots and remote villages. We tour a Ceylon tea factory before continuing to Nuwara Eliya, capital of the hill country and resort for the British during the days of the Raj. Horton Plains: We drive (1 hour 15 mins) to Horton Plains National Park, Sri Lanka’s highest and most isolated plateau, to walk (4 hours) through remarkable scenery – a diverse mix of open grassy expanses, forest, rolling hills and waterfalls; and not least World’s End, a sheer drop of 3,700 feet affording wide views of the plantations below. Late afternoon in Nuwara Eliya at leisure with time to explore the town, known as ‘Little England’. Ella & Tissamaharama: We travel by road towards Tissamaharama; a long, picturesque descent along winding roads to the plains offering numerous scenic highlights. After 2 hours we stop at the superbly situated village of Ella and walk (2 hours) through verdant countryside up to a panoramic viewpoint overlooking Rawana waterfall and Ella’s Gap. After lunch we continue on to our hotel on the edge of Yala National Park (2.5 hours drive), stopping en route to walk (1.5 hours) through paddies and along the bund of an ancient tank whilst observing abundant bird life and herds of water buffalo bathing in the lake. Yala National Park: Optional early morning walk through surrounding jungle and along the beach (1.5 or 2 hours). In the afternoon we visit the spectacular Yala National Park by jeep, renowned for its dazzling array of birds and wild animals including: leopard, elephant, spotted deer, sambar, wild buffalo, sloth bear, jackal, mongoose and crocodile. Galle: In the morning we take a boat safari along the Maduganga River to enjoy a wide array of wildlife and one of the last remaining tracts of pristine mangrove forests in Sri Lanka. Free afternoon to relax and enjoy our beachside hotel or further explore Galle. Galle – Colombo: Transfer to Colombo airport (2.5 hours). Walking / Trekking in Sri Lanka is on good, easy paths throughout. There are some possibly vertiginous rock steps to a monastery, but the route is visible from the base and you can decide whether you want to take the ascent. Sri Lankan food is delicious – similar to Southern Indian cuisine but often with greater quantities of spices and chillies. Milder options will also be available throughout the trip. Rice with fish/vegetable curry is a staple, but we will sample a wide range of Sri Lankan delicacies. Meals will be accompanied by Indian beers. Do I need a visa for this trip? Sri Lanka has a tropical climate. Temperatures are high throughout the year, with low-lying areas having an average temperature of 27˚C, with the cool afternoon breezes on the coast reducing temperatures. 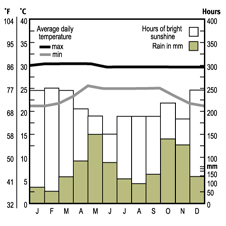 The interior highlands have a pleasant, warm climate all year (average of 20˚C in Kandy. The warmest time of year is February to May, which can be very humid. November to January is the coolest time. Sri Lanka is subject to two monsoons: the southwest monsoon from May to August and the north-east monsoon from October to January. This is a 14-day walking holiday with walking offered on 10 days, plus sightseeing. The walks vary from 1.5 to a maximum of 6 hours. Hours of walking, which may vary from group to group, means hours of actual walking and does not include stops for lunch, sightseeing, rests or siestas. The fitness level of this walking holiday is Grade 2+ - 3. Walks are along forest and jungle paths, through rice paddies, tea plantations, through parks and gardens. At some sights walks will include steep steps to the top. Boots with ankle support are recommended for many of the walks, as well as long trousers to protect against leeches in case of wet conditions. Some of our walks are very weather sensitive. If it is not possible to do a walk due to inclement weather, an alternative will be organised. Any such decision is at the discretion of the Tour Leader. On this trip, due to the mid-day heat, there are a number of early starts and late afternoon activity to take advantage of the cooler temperatures. There is 'down time' for a siesta built in to the itinerary. You may opt out of early starts if you wish! to allow you to walk for part of the day. If the itinerary does not involve a hotel change on a given day, you can simply stay in the town and explore, or relax and enjoy the hotel, and join (or not join) the group for lunch. The Tour Leader will discuss the next day’s options with the group every evening. The destination airport for this walking holiday is Colombo. There will be a set meeting time at Colombo airport for the transfer to the first hotel; a set time for the return transfer to Colombo airport at the end of the trip; and a 'recommended flight' to connect with the airport transfers. Booking the recommended flight - which we strongly encourage - guarantees transfers to and from the airports, irrespective of flight schedule changes or delays. For clients not on the 'recommended flight' we cannot guarantee a transfer from the airport should you be delayed for any reason in meeting the group at the specified place and time. In this instance you will have to make your own way to the first hotel, at your own expense. The transfer to the airport at the end of the trip will also be timed according to the recommended flight and we cannot offer transfers at alternative times. Please check with the Reservations Team before making independent arrangements. We strongly recommend that you pre-extend in Colombo to allow time to acclimatise and explore the city. Please contact the office for details of extension packages or hotel rates. If you take the recommended flight or are meeting the group at the airport our Tour Leader will be waiting to meet you for the transfer to the first hotel, which will depart shortly thereafter. S/he will be wearing a green polo shirt bearing the ATG logo. If you arrive late and find that the group has left (there is no sign of them in the arrivals hall) please check for a message at the information desk and/ or contact us. The ATG office number is +44 1865 315 678 or outside office hours please call the emergency number which is +44 1865 315 600. If you are meeting the group at the first hotel, our Tour Leader will contact you upon arrival. On our escorted walking holidays all meals are included. Sri Lankan food is delicious – similar to Southern Indian cuisine but often with greater quantities of spices and chillies. The island is overflowing with an abundance of fruit, vegetables, meat and fresh sea food. Over the last few centuries Sri Lankan cuisine has been influenced by Indian, Chinese, Malay, Arabian and European tastes. A staple dish is rice with meat or fish curry accompanied by 5-6 vegetables, grated coconut and fresh herbs. We will sample a wide range of Sri Lankan delicacies, which can be toned down to suit more Western tastes. Most of the hotels we use offer a buffet-style breakfast with a range of both hot and cold choices, and include both local and more Western dishes. Outside Europe the location of lunches may vary, from picnics to meals in restaurants or private houses, or packed lunches for more remote walks. Dinner is usually at about 8.00pm. We tend to eat in the best and most interesting restaurants available, which serve traditional local dishes as well as regional classics and excellent regional wines. To ensure that we enjoy the best that the area has to offer, the Tour Leader will have worked closely with the chefs in advance, selecting the most interesting and characteristic menu possible. This not only ensures that we eat far better than people who ‘come in off the street’, but enables us to enjoy a very wide range of local specialities during the trip, and also to cater imaginatively for those with special dietary needs. At the start of dinner each evening, it is ATG ‘style’ to tell you about the menus and wines for that evening. If there’s anything different that you would prefer, you have only to ask. When you book, let us know about any restrictions. This will give the the local support team the opportunity to prepare menus accordingly prior to your trip. At the start of the trip the Tour Leader will meet with you to discuss in more detail your requirements. There is no need to dress up on this trip, however you may like to bring a smart/casual change or two. On escorted trips everything is included (per the published itinerary) apart from travel to/from the destination airport, items of a personal nature, snacks and drinks outside of the set meals. If you book the trip as an independent departure there may be some costs to pay directly locally (eg tips), however we will make you aware of these in your bespoke costing. We are delighted to book extensions for you at either end of your trip, and we strongly recommend this option if reaching your destination means a flight of more than a few hours in length. We only book hotels with which we have an established relationship and where we can ensure a high level of service and enjoyment. We can also arrange bespoke packages to include sightseeing, meals and transfers. If you would like an extension booking please indicate this during the booking process and we will contact you with pricing information. You will also need a passport valid for 6 months beyond your travel dates. You should also consult your GP for recommendations relating to your personal circumstances. An antimotility drug such as: IMODIUM (it is not curative). An antibiotic disinfectant: a floxin such as CIPROXIN (excellent as a relatively generic antibiotic with other applications) or a FLAGYL. will carry them in our medical kit. All water should be regarded as being potentially contaminated. You should only consume bottled water, including for tooth brushing. It is customary to be offered tea when visiting locals and it is considered impolite to refuse. While there are no strict dress codes, Sri Lanka is a very traditional, conservative, family-oriented society - wearing revealing clothing is unacceptable. Though most casual clothes are fine, while visiting monuments, temples or old parts of any city, it is better to fully cover arms and legs, and you must remove shoes and hats. The rule is that you eat with your right hand only. In Sri Lanka, as right across Asia, the left hand is for wiping your bottom, cleaning your feet and other unsavoury functions, whilst the right hand is for eating, shaking hands and so on... The other rule to be aware of is that when eating or drinking your lips should not touch other people’s food – jhuta or sullied food is strictly taboo. Don’t, for example, take a bite from something and then pass it to someone else to try. When drinking be sure your lips don’t touch the container. This custom also protects you from things like hepatitis. It is also customary to wash your hands before and after eating. As well as our scheduled group departures, this trip is also available as a private escorted, or independent trip at dates to suit your diary. The recommended months to go are December through March. Our Reservations Team will provide a bespoke costing based on the number of people in your group and any special requirements. The destination airport for this walking holiday is Colombo. There will be a set meeting time at Colombo for the transfer to the first hotel; a set time for the return transfer to the airport at the end of the trip; and a 'recommended flight' to connect with the airport transfers. Booking the recommended flight - which we strongly encourage - guarantees transfers to and from the airports, irrespective of flight schedule changes or delays. For clients not on the 'recommended flight' we cannot guarantee a transfer from the airport should you be delayed for any reason in meeting the group at the specified place and time. In this instance you will have to make your own way to the first hotel, at your own expense. The transfer to Colombo airport at the end of the trip will also be timed according to the recommended flight and we cannot offer transfers at alternative times. Please check with the Reservations Team before making independent arrangements. There are regular, direct flights from London to Colombo’s international Bandaranayke airport. From the US and Canada flights are via India or the Middle East, from Australia via Malaysia, China and India. If you would like the ATG Reservations Team to book you a hotel for an extra night or two before or after the trip (which we strongly recommend) please indicate this during the booking procedure. For extensions booked through ATG, transfers to/from the airport to suit your flight schedule are included.